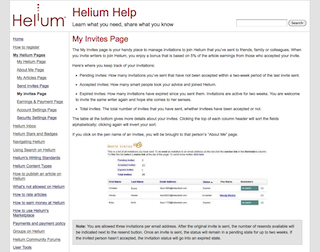 Helium (http://www.helium.com) uses the web to exploit a new publishing model—one that is largely created and controlled by its users. The site solicits articles from amateur and professional writers on just about any general interest topic—personal finance, parenting, health, the arts, home repair... you name it. Helium readers rate each article, and the best rated pieces garner the most visibility and higher reimbursements to the authors. Helium’s articles are also offered to other publishers for purchase. This user participatory model means that budding and seasoned writers have responsibility for creating and presenting content. Most don’t have the expertise or inclination to learn and keep up with all of the rules and features of the underlying technology. But since the site is largely user-driven, members must be able to manage workflow and explore the features of various user communities themselves. Sometimes when a problem arises, members need help immediately. Having up-to-date help content that can be easily found by users and frequently updated is essential to keeping the site running smoothly. Those responsible for maintaining online help content are not programmers. They are focused on the user community, and respond directly to their needs. Thus, it must be possible to rapidly create and publish help on a specific topic, and link it appropriately to other help information. The help solution needs to be easy for multiple participants to write, rewrite, and edit. Embedding help content statically in the various parts of the site doesn’t provide enough flexibility or a rapid enough publishing process. Administration of help files must be in the hands of those creating the help content, not another group within the company. So help file administrative tasks need to be obvious and straightforward. Other benefits that come from using EditMe, according to Flynn: all online Help immediately becomes searchable, individual pages can have specific access control, and the community can be invited to participate in creating online help in a controlled and effective fashion. “Helium has judged the first experiment and deployment with EditMe to be so successful that it has already added a second EditMe wiki to manage partner-specific help,” Flynn says. "EditMe won out, both because it provides the best balance of features, and because some individual features are best-in-class." Provide online help for non-technical users. Help content must be easy to create and edit. While allowing multiple users to contribute, help content must be well organized, able to be interlinked, and be properly organized. EditMe makes creating new pages and linking them into existing content intuitive. EditMe enables all online help to be immediately searchable, and individual pages can have specific access control.